"Betty's tough," Secretary of the Interior Sally Jewell told the crowd. In a surprise ceremony Sunday, Betty Reid Soskin, received a replacement for the commemorative presidential coin that was stolen from her Richmond, Calif., apartment during a violent attack. Soskin, 94, the oldest park ranger in the U.S., was attending a ceremony at Concord Naval Weapon Station to honor those who lost their lives during a deadly explosion in 1944 and commemorate the Port Chicago Naval Magazine National Memorial when she was called up to the stage, and given the coin. 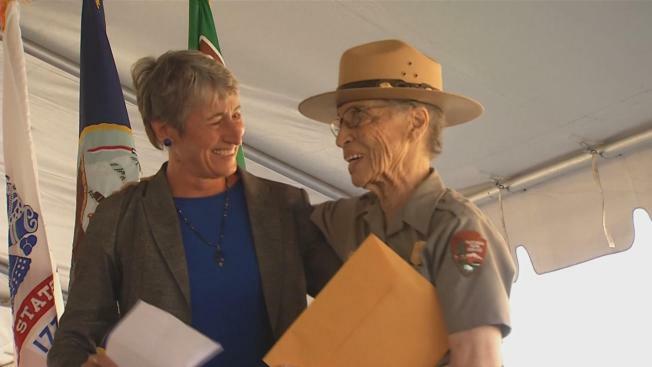 "Betty's tough," Secretary of the Interior Sally Jewell told the crowd, adding that President Barack Obama wanted to replace the special coin that was stolen on June 27 from Soskin's home as she slept. Soskin clapped her hands over her mouth to show her surprise and excitement. She didn't speak, and received a standing ovation as she left the podium. When she sat down, she quickly opened the envelope that Obama sent her and pulled out a new coin, rubbing it in between her fingers and holding it up for all to see, a big grin on her face. The original coin was stolen by a thief who also took Soskin's cell phone, lap top and jewelry and then punched her several times before taking off, Richmond police said. No one has yet been arrested. She earned that coin when she was invited to light the national Christmas tree in December, during which she introduced Obama and gave the president a big hug. After Sunday's ceremony, Soskin told NBC Bay Area that the first coin really meant something special to her because it had been physically touched by the president who had "cupped it in his palm" handed it to her "in secret" at that ceremony. The president must have known how "powerful" that was, Soskin said in an interview, even more so than giving her the coin publicly. Soskin returned to work last week, the first time since the attack, where her colleagues at the National Park Service, and members of the community at large, raised more than $50,000 to help her replace those items, as well as fund a documentary being made about her, according to the park service. Since she was 85 years old, Soskin has been working full-time at the Rosie the Riveter/World War II Home Front National Park in Richmond, Calif., where she moderates tours, talks to visiting groups and steps back in time to speak about living and working in the area during World War II. She famously grabbed national attention in 2013 during the federal funding crisis when she pleaded with Congress to step up and get its act together so that she didn't have to sit at home during a furlough.